Alongside the achievements in helicopter design of the famous Mil plant, the Kamov factory was to become the other twin pillar of the industry in Russia, developing from a specialist in reconnaissance to a leading producer of attack helicopters. While the helicopter design bureau of Nikolai Kamov was in some aspects eclipsed by the work of the Mil plant under engineer Mikhail Mil, the brain behind classics like the Mi-8, Kamov was the other driving force in the sector’s massive growth from the 1940s. A native of Siberia’s Irkutsk Region and the son of a teacher, Kamov was regarded as a down-to-earth man of the people. But nothing foretold his rise as one of the largest helicopter manufacturer engineers in history. In the 1920s, the construction of propeller-driven aircraft in the Soviet Union was the work of individuals and was done in crude conditions. It was these unlikely workshops that gave rise to the future Kamov factory. In 1929, the 27-year-old engineer built the first Soviet autogyro reduced helicopter. Its immediate practical use was negligible, but this potential game-changer in aviation technology soon attracted attention. Kamov gyros were used in agriculture, particularly in mountainous areas where conventional aircraft were ineffective. In 1938, the design took part in a prominent expedition to rescue Soviet polar explorers drifting on an ice floe, and in World War II they were used for reconnaissance and the transportation of people and goods, having the critical advantage of being able to take off and land without a runway. After the war, funding opportunities arose for a new branch in the USSR military industry. Together with the Mil plant, the Kamov design bureau became its main engine, and from the outset Kamov helicopters had one feature that set them apart from the rest – coaxial rotating propellers. The idea was simple and ingenious: Two screws or props are placed on one drive shaft but rotate in opposite directions. The technique balances the motion created by each screw and affords the pilot better maneuverability and handling. In 1948, the Kamov design bureau emerged as a full design and production unit, headquartered in Lyubertsy by Moscow. The bureau first specialized in the production of helicopters for the navy. Its first Kamov prototype, the Ka-8, proposed in 1944, was intended for navy communication and reconnaissance. But the technical innovations of this first aircraft proved so successful that they provided the basis of a whole range of new helicopters – the Ka-10, Ka-15 and Ka-18. However, the real breakthrough was the famous Ka-25, the first Soviet helicopter specifically assigned for combat use, with its specialty the complex operational tasks of the detection and neutralization of enemy submarines. In the absence of location markers on the surface the Ka-25 was the first aircraft to have all-round visibility. The Ka-25 led to the Ka-27, which spawned an entire new family of helicopters, the Ka-27PS rescue aircraft and the export Ka-28 combat helicopter, as well as the Ka-29 troop-carrier. The Ka-31 radar variation was a unique development, with radar technology powerful enough to detect enemy ships, planes and missiles at up to 200 miles. In the 1980s, the Kamov factory went way beyond its original scope. 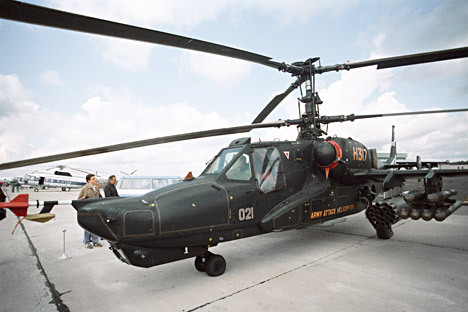 The design bureau was put to developing assault helicopters, the most famous of which, the Ka-50 or "Black Shark,” could carry various cannons and machine-guns, guided and unguided missiles, and a regular bomb payload. However, the design had one major drawback: The cabin only held one pilot who could not adequately fly the helicopter and detect and strike targets simultaneously. One idea was for the Ka-52 to be used in pairs, sharing the range of operational tasks, but its impracticality of the idea soon became apparent. The series then saw the launch of its twin-seat Ka-50 modification, the Ka-52 Alligator. Today, this is the mainstay of production at the Kamov plant and the aircraft is already looking to the future: Before 2020, the Russian air force plans to field 145 Alligators, cementing the plant’s growth toward the next generation of helicopter technology.